Venus will pass in front of the Sun on June 6 this year. A RARE astronomical event, which will be visible on Australia's east coast, has historically coincided with the aftermath of major developments in the human race. Byron Bay astrologer Pasty Bennett said Venus moving across the face of the sun had coincided with the aftermath of events such as the industrial revolution and age of enlightenment as well as major upheaval, such as the Seven Year War and the 30-Year War. She said, clouds permitting, people could see Venus start to move across the sun about 8.15am on June 6 and finish about 2.45pm the same day from the nation's east coast. "We'll see Venus crossing from the lower-right quadrant of the sun towards the lower left quadrant, at a slight angle upwards," she said. "We will not see this transit again in our lifetimes. "The Venus transit across the sun occurs in pairs within a larger cycle of over a century. "There is a time span of eight years between the pairs. 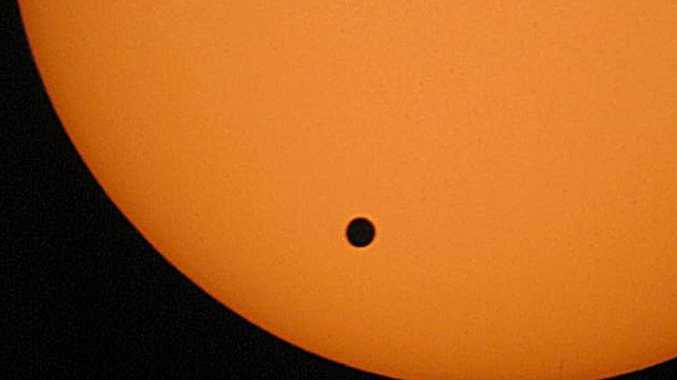 The June 6 transit is the second of a pair; the last occurred on June 8, 2004. The next transit will occur in 2117. "The size of Venus is comparable to the size of the Earth, so this transit gives us an idea of our size in comparison to the Sun." Ms Bennett said watching Venus move over the face of the sun helped astronomers work out the distance of the earth from the sun and other scientific advances. But she said in the astrology world Venus signified values because "it measures what is important to us". "Venus is popularly associated with love, beauty, desire and money astrologically," she said. "We are currently in another era of major developments and rapid expansion with unprecedented circumstances within our lifetimes, such as the Global Financial Crisis, global political concerns, environmental concerns, the communications revolution. "So, astrologically, this Venus transit is reminding us of our values. "On a personal level, this transit could bring events which occurred during the last 'twin transit' in June, 2004, back into view, which could mean swift progress on from events then, or even a return to events which were of particular significance at that time." Ms Bennett also believes a partial lunar eclipse, which should be visible from Australia between 8-9pm. "This eclipse is at a particularly sensitive point in Australia's chart," she said. "This event, in connection with the Venus transit, could see significant news regarding Australia's financial situation; or regarding its status or direction as a whole." Remember to view the sun through its projection onto a white board or screen, and do not look at the sun directly. Keep an eye on children, too, as permanent eye damage could result from looking at the sun. Specialist shops sell special telescope filters or use eclipse glasses from the last Australian eclipse. If you have binoculars, stand with your back to the sun and project the image onto a piece of white card through the binoculars. There will be a black dot moving across the face of the sun. The dot will only appear as a relatively small one, as Venus is about one thirty-third of the size of the sun.